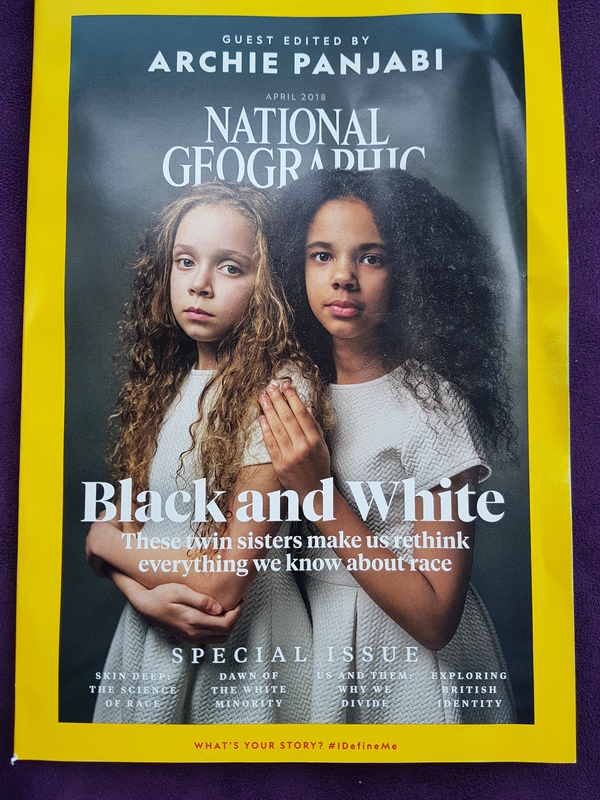 April 2018 cover – “Black and White: These twin sisters make us rethink everything we know about race” – the National Geographic (Nat Geo) says it’s covering and addressing its past racist coverage, yet in the article associated with the cover photo of the April 2018 issue, Patricia Edmonds continues the form of reporting that Nat Geo says it’s moving away from. The fraternal twin girls shown on the cover, Millie and Marcia Biggs, are described thus: “From a young age the girls had similar features but very different color schemes. Marcia had light brown hair and fair skin like her English-born mother. Millie had black hair and brown skin like her father, who’s of Jamaican descent.” Therein lies the continuing problem of discriminatory reporting. As an English-born person who is of Jamaican descent this description is problematic for me because Edmonds’ article insinuates, in standard Nat Geo racist tones, that the white mother equates to the English-born descriptor and the Jamaican descent father is the black hair and brown skin ‘other’ in the equation. Nat Geo is still reinforcing the idea that to be English-born you are automatically viewed as white, whilst Jamaicans are generalised as black; this diametric opposition is what was the root of Nat Geo’s historical reporting, and this issue, as well meaning as it is supposed to be, has failed to reposition itself away from stereotypical statements, photographs and phrases like ‘very different color schemes’. Some of the questions that arose for me when reading this article were: from what nationality does the English-born mother, Amanda Wanklin, descend? Where was the black hair and brown skin father, Michael Biggs, born? If it is important to describe the birth place of one parent and the descent of the other parent, then in an effort to reduce racial stereotypes and promote equality surely the same conditions should be applied to both parents? Isn’t the tone of this article reinforcing the same stereotypes ingrained in white American culture that the editor-in-chief, Susan Goldberg, suggests that this issue is supposed to be pushing its readers beyond? To me, this article resets the tone as one of continued racial divisions based on both birth location and heritage. In the Nat Geo “Black and White” essay Alicia Martin, a statistical geneticist is referenced as stating that the traits of fraternal twins that emerge in each child depends on numerous variables, including “where the parents’ ancestors are from and complex pigment genetics.” As this article does not directly address where the twins’ maternal ancestors are from, the reader of the article is left with the assumption that ‘English-born’ relates to an unending line of similarly born ancestors who will be categorised as white and therefore quintessentially British. Nat Geo may have had good intentions, but from my reading of this issue they have faltered and failed on the first steps to explore race and diversity in America. I know that many people have lauded the publication of this issue as a wonderful event, yet I still see it as a P.R. exercise to excuse a back catalogue of discriminatory reporting, and to feed the American white supremacist’s and far-right’s angst about them again becoming a minority in the country they invaded: “In two years, for the first time in U.S. history, less than half the children in the nation will be white.” (From the editorial by Susan Goldberg). National Geographic, you cannot correct past mistakes by perpetuating them.